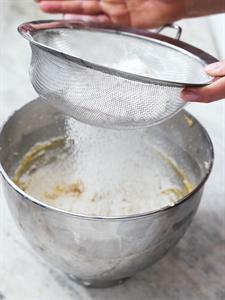 Now sieve in 175g/6oz self raising flour and using a metal spoon gently fold it in. The mixture should be a dropping consistency. 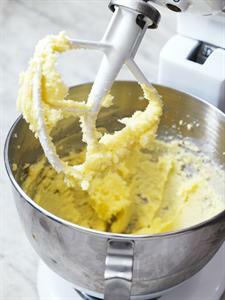 If it is too dry add a little water or milk and if too wet add a little more flour. 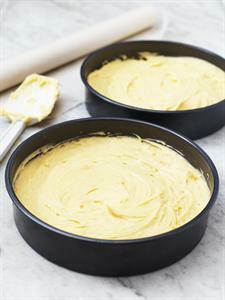 Grease 2 x 20cm/8inch round loose bottom sandwich cake tins and line with greaseproof paper. Now divide the mixture between the tins and spread evenly. Put in a pre-heated oven at gas mark 5/190C (180C in a fan oven) and bake for about 20 minutes or until the cakes are risen and lightly golden. They should spring back when pushed with fingertips. Remove from the oven and allow to cool for a few minutes, then turn out onto a wire rack to cool completely. 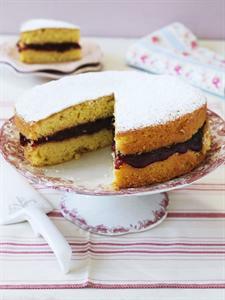 Sandwich together with raspberry jam and dust the top with sieved icing sugar or caster sugar.